Bruce L. Simpson was born in Chicago, IL on November 14, 1912. Mr. Simpson attended Hobart College in Geneva, New York and the Northwestern University in Evanston, IL. He was granted a B.S.L. Degree from Northwestern University in 1934 and a L.L.B. Degree in 1936 from the Northwestern University Law School. He was admitted to the Illinois State Bar in 1937 and was associated with Ashcraft & Ashcraft, a law firm in Chicago. He became associated with the National Engineering Co. (now Simpson Technologies Corporation) in 1937 in the Production Department. In 1938 he was advanced to Production Manager, in 1939 to Process Sales, in 1940 to Vice President, and in 1943 became the third generation of the Simpson family to be President. Bruce Simpson was been a Director of the Foundry Equipment Manufacturers Association (now CISA) and also served as director for the Foundry Educational Foundation. Bruce Simpson was a long term member of the American Foundry Society as well as one of its most loyal supporters. Bruce Simpson served as the fifty fourth President of the American Foundry Society from 1955-1956. 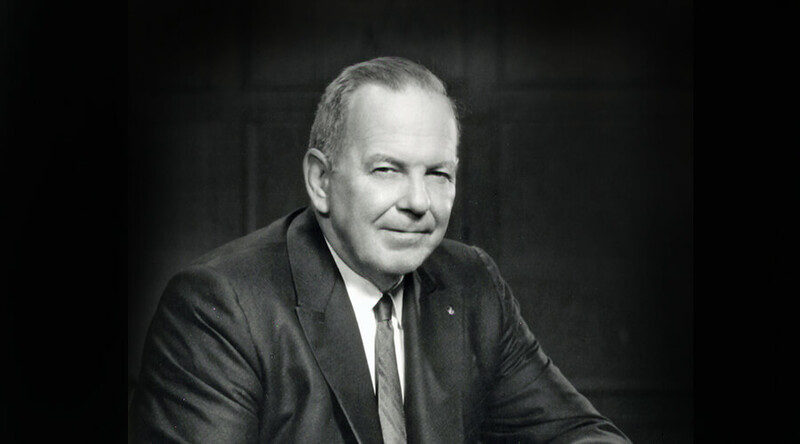 In addition to his term as President, he served AFS as Secretary and Treasurer of the AFS Chicago Chapter; Chairman, Retirement Fund Trustees, 1948-57; National Director Class of 1949; and National Vice-President from 1954 to 1955. He spoke before most of AFS Chapters, and was the author of “The History of the Metalcasting Industry,” published by AFS. In his “Salute to the Author” at publication, then President S.V. Wood (1946-47) paid tribute to the contributions of the Simpson family when he wrote, “This volume is but one of the great contributions which the Simpson family – Peter L., the father; Herbert S., the son; Bruce L., the grandson – has made to the foundry industry. It has been my privilege to know intimately all three generations of this family. ‘Pride of craft’ in each generation has been a constant inspiration to their associates.” He was recognized for his lifetime of service to the industry when Bruce Simpson was awarded the AFS McFadden Gold Medal in 1976. Bruce Simpson died in 1988.